”Batmen Forever” is pretty much a direct sequel to the previous arc, “Fall of the Batmen.” In the aftermath of that storyline, the various members of the Bat-family are struggling to heal – Tim especially. Meeting one’s future self would be understandably unnerving, especially learning you become everything you hate. To say Tim is in a fragile place would not be wrong. Enter Ulysses Hadrian Armstrong. He has an agenda, because he’s pilfered Future Tim’s historical software, and knows where the Bat-family ends up. He knows what becomes of Tim and why. And he’s prepared to use that knowledge as leverage to make certain Tim follows that path, one way or another. To do so, he compromises Brother Eye and its OMAC protocol, perverting it and the private army known as the Colony – which is under the command of Batwoman’s father, and recently added her to its ranks. 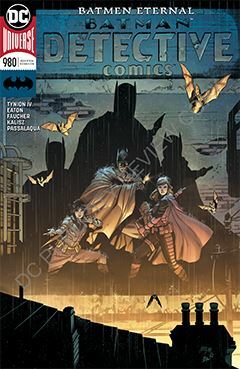 Events lead up to the entire Bat-team (Batman, Red Robin, Batwoman, Batwing, Azrael, Stephanie Brown and Cassandra Cain) challenging Armstrong for control, of their collective future. Combined with the previous story arc, the two stories (12 issues in total) read like portions of a trilogy. It’s ambitious storytelling, and I appreciate the scale Tynion was striving for. It’s an epic story for Batman & Co.
And therein lies my only complaint. I remember a time when Batman was pretty much a lone crime fighter. Detective Comics was entirely Batman-centric, but today, the book features a much larger cast, and in my opinion, it’s become a burden. Perhaps modern times demand it. The stakes are higher in Gotham, and prowling the city’s dark streets in search of street crime no longer makes much of a difference. Plus, it doesn’t make for very good storytelling. But perhaps Batman’s ancillary partners need their own book.